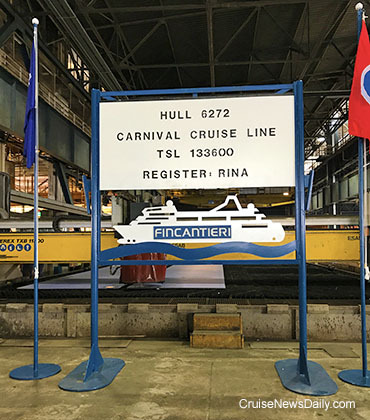 Fincantieri began work today at their Marghera yard on hull #6272, by cutting the first steel for the ship. The sheet metal will then be assembled into blocks and those blocks will then be assembled in the dry dock into Carnival's third Vista-class ship, which at this point, is still unnamed. The plasma torch in the background cutting the sheet metal is cutting the first steel for Carnival Vista 3. 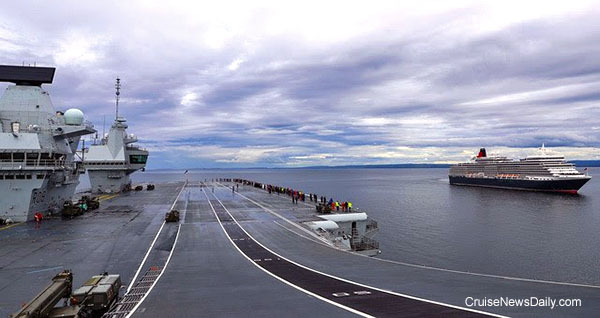 Britain will soon have a new aircraft carrier which is named HMS Queen Elizabeth. She will be commissioned shortly, but is currently on sea trials off the coast of Scotland. 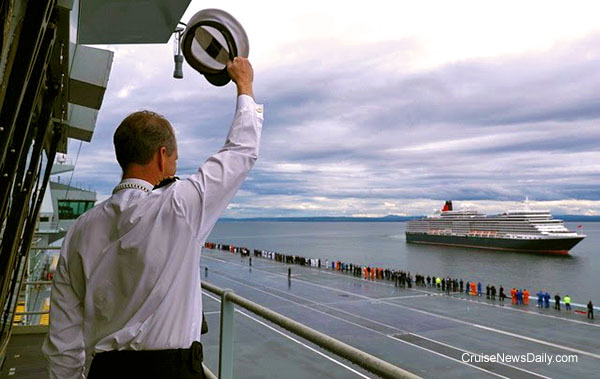 Cunard's RMS Queen Victoria is currently sailing a 13-night British Isles cruise. Yesterday (July 6) their paths crossed in the Moray Firth. Photos are courtesy of the Royal Navy. All rights reserved. May not be copied or used without permission. The completion of the project to dismantle and recycle Costa Concordia. MSC has added a number of service enhancements about being ashore beginning with MSC Meraviglia which entered service in the Mediterranean last month. The most notable is a new port info service in which personnel at the ship's Port Info Desk have been trained by local tourist boards in each port to become experts on the ports of call. Here's an idea to keep in the back of your mind for the next time you are sitting in the audience of an improv show and they want the audience to throw out ideas: A group of actors getting fired from a cruise ship job. The Chicago Sun-Times reports that Second City improv troupes will be ending their run on Norwegian Cruise Line ships early next year. On May 21 Majestic Princess set off from Rome for her new homeport in China along the traditional sea route of the ancient Silk Road, and Monday it arrived in China. The route took the ship and more than 7,000 passengers to ports in Greece, Jordan, the United Arab Emirates, Sri Lanka, India, Malaysia and Singapore to Xiamen, where the ship was welcomed to China. The voyage is continuing to Hong Kong, Taipei, Tokyo, Osaka, Seoul, and Shanghai where the ship will be based when it arrives on July 9. The object of the voyage obviously was to reposition the ship from Italy, where it was built, to China, but during the trip, the focus was on promoting Chinese culture and tradition. Who doesn't enjoy a free burger? Especially if it comes with message thanking you for what you're doing right on top? The Marines at Miramar Air Station at San Diego did today at Carnival's “social media-powered barbeque” - nearly 2,000 of them. It shouldn't be much of a surprise that commissioners at Port Canaveral voted unanimously last week to move forward in building a new cruise terminal and parking ramp on the south side of the port on the site of the current Terminal 3. It will open in late 2019.